Owners of Audio Alchemy components may feel left high and dry by the demise of the "good sound-good price" company. While the story is told that the company will resurface after reorganization, time alone will tell. Recognizing an opportunity, Monolithic Sound and Channel Islands Audio have stepped into the picture to offer some enhancements for those of us who own Audio Alchemy Digital to Analog Converters (the Digital Decoding Engine series) and Digital Signal Processors (the DTI series). Through the course of this article I'll be referring to these components as DAC's or DSP's. Monolithic Sound, Inc. is owned by Greg Schug and run by him and his brother, Eric. They have been in business for about 25 years, primarily as an OEM (original equipment manufacturer) for other high-end audio manufacturers. 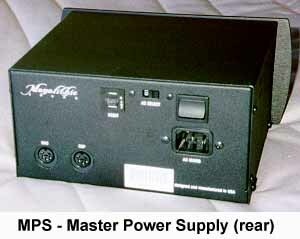 The MPS Power Supply is the first home audio product to carry the Monolithic Sound name, and was designed by Greg Shug and Dusty Vawter, with Richard Liddell helping with the printed circuit board layout. Richard and Dusty are former employees of Audio Alchemy. Richard was an Engineer and Dusty, the Technical Service Manager. Channel Islands Audio is Dusty Vawter's retail/repair business. He specializes in repairs, modifications, accessories and upgrades for Audio Alchemy products. As a former technician with Audio Alchemy, Dusty is very familiar with their products, and is offering a parts upgrade and a modification (non-HDCD encoded digital attenuation bypass) to the DDE v3.0 D/A converter. He is also currently working as a consultant on a new line of Monolithic Sound products to include a low-cost phono stage, a remote controlled preamp, and class A amplifiers (stereo & monoblock) to be released by the end of 1997. Busy Beaver, and a heck of a nice guy. Everything I've studied over the years has emphasized the importance of the power supply in the design of audio components. The plumbing analogies are best to describe the movement of electricity. The power company, house wiring, and the power cord / transformer of the product, provide the rain that fills the reservoir (capacitors). We pump water through pipes (wires), using pressure (voltage) and flow (current). Valves (diodes) and faucets (transistors, tubes) are parts used to manipulate the water (electricity). The job of the power supply is that of the dam holding back and releasing the water; always with enough water behind it to supply the pressure (voltage) and flow (current) we ask of it, even at peak times. We task the power supply further by asking it to do this in a noise free fashion. Generally, bigger power supplies do this better than smaller ones, though the laws of diminishing return apply here, as well as anywhere else in audio. The MPS was designed because of the limitations of the Alchemy "upgrade" supplies. For example, the Alchemy PS2 has output ports for up to three devices. This sounds like a good idea, but if you connect multiple units to the PS2, the power will be shared by all of the components, limiting the performance of each. The PS3 is an unregulated version designed to power a single component. The PS2 is the only Audio Alchemy power supply that is regulated, and Dusty states that none of the AA supplies have the extensive filtering of the MPS. Other problems with the Alchemy supplies have included noisy transformers (both mechanically and electronically) and inferior rectifiers. The Audio Alchemy PS2 and PS3 were designed, for their best performance, to power a DAC or DSP unit. Since the DAC's and DSP's each require a different voltage, the supplies are ideal for neither. Weighing in at around five pounds, the MPS is approximately 7.25 inches wide, 4 inches tall, and a notch over 6 inches deep. It is apparent that it was designed to aesthetically combine with the Audio Alchemy units, as it sports a similarly curved edge faceplate and matches the height of the DTI.Pro 32 and DDE v3.0 when stacked. The front panel is dressed with but a single LED indicating power on when lit. On the flip side there are six pin DC output connections for DAC and DSP, a reset button, AC voltage selector (115/230v), a female port for an IEC connector power cord, and an ON/OFF rocker switch. This rocker switch allows you to power the DTI / DDE combo without glitch problems, such as losing secondary lock or no output of sound. The inside of the power supply is extremely clean and well laid-out looking. The MPS uses two E-core type transformers (one for the DAC's analog stage and one for the digital circuits of the DAC and DSP). The transformer used for the digital circuitry is rectified in a way that ends up with three separate outputs: +8v @500mA, -8v @500mA (DAC) and +8v @1A (DSP). Dusty says the transformer is center tapped with a full-wave bridge for the +8v, and a half-wave bridge for the +/- 8v outputs. The transformer for the analog stage supplies a regulated +/-18v @1A (per rail). All of these outputs are individually regulated and filtered. As for performance, Monolithic uses ultra-fast diodes in the rectifier circuits, input caps capable of withstanding high ripple currents, and low ESR (electrical series resistance) output caps in the analog stage. Greg Schug selected transformers with particular qualities to get the audio performance, reliability, and quiet operation (ie. low mechanical and electrical noise) they were looking for. The supply is housed in a shielded steel chassis connected to AC ground. All DC grounds are isolated from each other and AC ground. The MPS is meant to be placed next to the gear being powered, which shortens the path between the supply's output caps and the input of the product being powered. The MPS is claimed to lower the operating temperature of the DTI.Pro (the predecessor to the DTI.Pro 32) by 30-40 degrees over the AA power supplies, due to its lower voltage output. The DTI.Pro 32 will run at about the same temperature as with the Alchemy power supplies. Dusty claims the sonic improvements from the DSP output is mainly due to the added filtering. On the DAC port, the analog supply is said to be much faster and cleaner than either the PS2 or PS3. 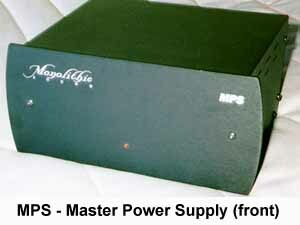 For availability of the MPS power supply please contact Monolithic Sound or Channel Islands Audio directly (see end of page for contact information). The work on the DDE v3.0 is really more of a parts upgrade than a modification. Dusty upgrades several critical parts in the signal path and optimizes many of their values. All of the parts replaced pertain to the analog stage. Four of the analog stage power supply filter capacitors, six passive filter capacitors (part of a high-frequency passive filter between the analog outputs of the DAC chips and the analog stage), two feedback capacitors, two resistors, and two analog stage opamps (and sockets) are substituted for the original factory parts. The AD1862 DAC chips are then shielded to lower noise picked up by the analog stage. Once the parts swap has been completed, each unit is burned-in for 24 hours, tested and "listened to" before shipment. Dusty also suggests bypassing the 6dB of attenuation on standard (non HDCD encoded) discs, provided by the Pacific Microsonics PMD100 filter. He says that this "can easily be done by removing pin #19 of the PMD100 from its socket and connecting it to pin #22 (+5v)." This is a good point to remind you that your warranty from Audio Alchemy (it's understood that they are still honoring warranty repairs while in reorganization) will be voided if any of the modifications or parts upgrades are performed. (Disclaimer time -- SoundStage! recommends any such work be done by a qualified technician and assumes no responsibility for damages of any nature. Proceed at your own peril!). If desired, Dusty will do the bypass at no extra cost when performing the parts upgrade. I had this modification done many months ago, and recall hearing an added strength to bass and a small increase to inner detail. As a further service, Channel Islands Audio will install an optional microprocessor chip for $59.00. The PMD100 digital filter can add a preselected amount of dither to a non-HDCD encoded signal with the microprocessor in place. Dusty assured me that this dither is not redundant with the dither setting selected on the DTI.Pro 32. With dither added at this stage, low level linearity is said to be improved. The microprocessor will also allow digital attenuation when using a prescribed sequence of front panel buttons, however the remote control "wand" is no longer available. The down side of digital attenuation is a one bit loss of resolution for every 6 dB of attenuation applied. Simply put, if you were getting full 16 bit word (or interpolated to 18 or 20bit) length output without digital attenuation, you'll be listening to 15 bit words (17 or 19 respectively) if you drop the volume down by 6dB. Those of you who use the DDE V3.0 without a preamp between it and the power amplifier may find this function useful. For any of the modifications or to purchase the upgrades described above, call Dusty Vawter direct at Channel Islands Audio. The temptation to just put both the new power supply and modified DAC into the system and wail away was there, but our readers deserve better than that. I started with the MPS power supply in conjunction with the non upgraded (herein referred to as "standard") DDE v3.0 (PS2 on the DTI.Pro 32). The MPS clearly surpassed the performance of the PS2. Listening to my man, Chris Isaak singing "Wicked Game" (Heart Shaped World - Reprise 9 25837-2), I easily heard an increase in air around individual events, and an added richness to vocals. There also was a lessening of edge on the attack of the guitar solo. While still quick in response, the leading note of the solo had less of a steely bite. These kind of improvements used to strike me funny from better power supplies. I used to wonder why I would hear more air, more richness etc., as opposed to only less hardening of the sound due to the power supply not running out of gas. Through three upgrades of power supplies on this equipment I've heard these kinds of improvements in increments. I no longer try to justify what I hear electronically. I merely report on it, and stick by my opinions as being just that - opinions. Next, I put the PS3 back on the v3.0 (I feel the alphabet / numeric soup syndrome coming on -- hang in there) and slapped the MPS on the DTI.Pro 32. Using A/B/A listening comparisons I was able to identify a tightening of focus, in particular, in the upper bass region, and as well, increased resolution of low level detail. There was a return of some "edge" to the guitar solo, as was expected, since it was removed when the MPS was used on the DAC. Time to set aside both the PS2 and PS3 and find out if the MPS had the chutzpah to take on both digital doo-dads. No question and easily a no-brainer. Take all the nice things said in the two paragraphs above, and then realize the compliment that a tightening of focus with an overall relaxing of the music can be. Powering both units, the MPS provided a noticeable reduction of the smearing of individual notes, therefore giving a feeling of less homogenization to the music. In plain English, the music sounded less canned and more real, dare I say analog-like? Listening to the beautiful trumpet work in the latter parts of "Blue Spanish Sky," also on the Chris Isaak disc, the instrument sounded more distant than with the Alchemy supplies. It seems this effect was intended in the production as its lower amplitude (the strength of a sound without regard to its frequency content) relative to the lead vocal and acoustic guitar would indicate. With the MPS on both components it sounds as if there is an increased amount of physical distance between the trumpet and the guitar / vocal, than heard using either the PS2 or PS3. I get a better feel for the distance that the trumpet was physically located away from the microphone. Another aspect that improved noticeably was the perceived lengthening of the decay on the guitar strings, adding to a much more "alive" sounding presentation. Relax, you're in good hands - Dusty's. Maybe we all hear things a little different, but I'm in total agreement with Dusty on the improvements that can be done to the analog section of the DDE v3.0. I was fortunate enough to have a fully upgraded DAC to compare to my standard one. You're probably not going to have this opportunity, so be forewarned that you'll be throwing caution to the wind here a bit. This being the case, I quizzed Dusty on what if someone doesn't feel the upgrades bettered the performance of their previous standard version. "So far, everyone has liked the improvements but if someone wasn't happy with it, I'd do what it takes to make them happy. I don't really have a policy other than make the customer happy. If they wanted me to, I'd return it to stock form and return their money (including all shipping costs)." Feeling better? After listening and comparing the revised and standard DAC's, I decided to have mine hot-rodded. Here's a second warning. When you get yours back, plan to put 80-100 hours of burn-in on it before setting any impressions. It took that period of time for mine to open up and perform like the fully burned-in DAC Dusty originally sent. The first thing I did was run some in-room SPL measurements comparing the modified and standard DDE v3.0's. Okay......I'm lying. I listened to a bunch of music first, 'cause my patience level isn't but so high. With the informal SPL testing I found the frequency response of both units effectively identical, but the output of the upgraded DAC was roughly 5 dB less than that of the standard unit. Both of the DAC's had their output attenuation jumpers removed, so this was not the culprit. I confirmed with Dusty that the (optional) microprocessor installed in the modified DAC was opened up fully (no digital attenuation applied), therefore not accounting for the difference in output level. He then informed me "the difference in output level is due to the bypassing of the digital attenuation and the modified I/V (current to voltage) converter." The Pacific Microsonics PMD100 digital filter has 6 dB of digital attenuation (a one-bit resolution loss) built-in for non HDCD discs, so that they will play back at the same level as HDCD encoded discs. When the digital attenuation is bypassed, Dusty also lowers the value of the resistors in the I/V converter. This improves the performance of the DAC chips, produces 20-bit performance, and reduces gain to near "standard" output level. Once this modification is done, HDCD discs will still properly decode, but will playback 6 dB less than non-encoded discs. Dusty says he ends up with about 3v maximum output in comparison to the full open 3.6v of the standard DDE V3.0. If you prefer to use more of your preamps volume control (some feel better tracking is obtained as you further turn the knob to the right), you can still use the output attenuation jumpers that come with the standard unit, to reduce the V3.0's output in the analog world. The jumpers are "essentially the same as a stepped attenuator and cause very little degradation," according to Dusty. Having spent the previous weeks listening to the system with the Monolithic Sound MPS installed, I felt it best to assess the standard and upgraded v3.0's using it instead of the PS3. I felt trying to reaclimate my ears to the PS3 at this point would have been counterproductive. I'll focus on the differences between the standard and upgraded V3.0 here, and how the upgraded v3.0 and the MPS work together in the next section. When listening to "St.James Infirmary Blues" by The Brassworks on Stereophile Test CD2 (STPH 004-2), a rounder tone to the trombone was noticed with the upgraded DAC. The trumpets had a warmer, more lively sound quality, and a better sense of the acoustic environment around them. Each brass instrument was discernible from the others, allowing me to experience the finished recipe, as well as savor the individual ingredients. The upgraded DAC consistently sounded crisper, though not to excess. "On The Turning Away" from Pink Floyd's Momentary Lapse Of Reason (CXK 53180 - CK 53189 of the box set Shine On), demonstrated this on David Gilmour's vocals and the instrumental upper mids. Remember, I found in-room frequency response between the two units almost identical, so this is not because of a mid / upper midrange tilt-up created by the upgrades. Could it be but a removal of a layer of veiling, allowing an increase to clarity? That's my conclusion, as I find the upgrade to be a bit more transparent than the original Audio Alchemy design. "Too Proud" from Mighty Sam McClain's Give It Up To Love (JVCXR-0012-2) had more bass slam that sounded warmer and rounder with the upgraded v3.0. Sam's vocals were considerably less congealed when he'd set to borderline screaming. On "Lonesome Road" I heard Sam issue a smallish chuckle that I had never noticed before, indicating an apparent increase in low level detail. As an added treat, Sam's voice sounded less boxy compared to the standard DAC. The increased clarity and transparency only comes about after full burn-in. As I lived with the upgraded DAC in a reverse life cycle mode, auditioning a fully conditioned unit first and then having mine freshly rejuvenated, I had a week of "damn, I miss that sound" after mine UPS'd itself back from Dusty's shop. Nonetheless it all came back around, and everything I had heard in the first unit was replicated in mine. 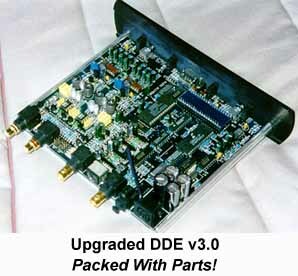 If Stereophile thought the DDE v3.0 to be a class C product before (to which I would agree), I would wager the upgrade from Channel Islands Audio would bump it up a notch to class B. Now things get real fun. While both units separately result in an improvement to my system's sound quality, tieing them together and letting them enjoy each others' company was never to be second guessed. The piano solo on the title track of Robert Lucas' new disc Completely Blue (Audioquest AQ-CD1045) sounded live and what my mind was telling me a piano should "timbrally" sound like. On "Kansas City Monarch" from Ronnie Earl and the Broadcasters' Still River (Audioquest AQ-CD1018), the drums and bass kick in with an impact that previously was less dramatic. On "Soul Serenade", from the same disc, I was clearly able to discern the cymbal work that before had been lost amongst everything else going on during the complex passages. Rock recordings fared as well as the blues. Pink Floyd's The Wall (Also from the box set) to some is a dismal telling of a story, but to me it's a work of art. On "Nobody Home" the background conversation on the intro is much clearer. Some of these words previously unknown, could now be followed. Roger Water's voice lost its annoying edge and sounded more palpable. The kick drum on "Comfortably Numb" and "Waiting for the Worms" was more visceral and punchy, than when listening to the standard DAC or the PS2 / PS3 combo. This same added punch was heard on "Peace" from Los Lobo's Kiko (Slash / Warner Bros. 9 26786-2), and added more "drive" to the music. One of my biggest disappointments of the season had been the Mobile Fidelity Release of The Joshua Tree from U2 (MFSL UDCD 650). This had long been a favorite disc of mine, and I've waited many years for a better production than the original Island Records pressing. I still haven't found what I'm looking for with the MoFi. I wanted clarity and I wanted dimensionality. Until hooking up the MPS and the upgraded v3.0 all I ever had was a teasing of such things. This is the first time I've actually smiled while listening to it. It's still not where I'd like it to be, but with the new gear it's a bunch of steps closer. I'm guessing the original tapes must not have been a sonic knockout to start with. Classical music such as "Gnomus" from Pictures At An Exhibition off Witches' Brew (Classic Compact Disc LSCCD 2225) exhibited a very detailed picture that didn't take that extra step towards analytical. The choral vocals at the end of "Neptune, the Mystic" from Holst's The Planets (Deutsche Grammophon 439-011-2) were more holographic and set back in the soundstage. On "Saturn the Bringer of Old Age", I could hear the performers breathing-in during the quieter passages. Those breaths are not something I spend precious time looking for, but when you hear such a thing without trying it adds to the illusion. I still feel we've got a good wait till any new audio-only formats find their way into our listening rooms. It tends to make one hesitant on spending a whole heck of a lotta scratch on upgrading an already fine sounding digital system. Yes, all-analog campers -- I do enjoy my digital system. Send me a few thousand dollars and I'll bask in the joys of round vinyl as well. It's either/or on my budget. I'm a spoiled brat, sonically speaking. I want as good a sound as I can afford, and I want it now. While I was plenty fine with my system before the presence of the MPS and Dusty Vawter's handiwork on my DDE v3.0, the improvements they make are, in my opinion, well worth the roughly $600 plus. If you told me I'd have to spend many thousands replacing my current digital front end to acquire the level of performance that I'm currently enjoying with these two products installed, I'd have to do some serious soul searching. Monolithic Sound and Channel Islands Audio are offering a primal pleasure between here and the future, without costing so much as to engage any guilt feelings about doing so. I bought them both and sold off my other power supplies, so financially we're not talking a lot of pain here. The Monolithic Sound MPS power supply and the parts upgrade / modification to the Audio Alchemy DDE v3.0 are both recommended by this writer. The work on the v3.0 DAC is a little bit of a crap shoot in that you don't get to listen to it in its beefcaked form first. Having had the opportunity to do so, it really turned out to be music to my ears. As always, your results could vary. Just remember Dusty's comments about this earlier and you'll be okay. Gotta go. Can't spend forever looking at this screen what with the sweet spot beckoning me to "come on out and play!"